The (+)-strand viral RNA genomes are often translated by the host to polyprotein. Then the virus provides protease to cleave these precursors into mature proteins co-translationally. One of these proteases was found in the plant pathogenic Tobacco Etch Virus (TEV)1. For scientists the TEV protease is a molecular tool to cleave of all sorts of protein tags precisely due to its sequence specificity. It recognizes the amino acid sequence Glu-Asn-Leu-Tyr-Gln-Ser and cleaves then between glutamic acid and serine. 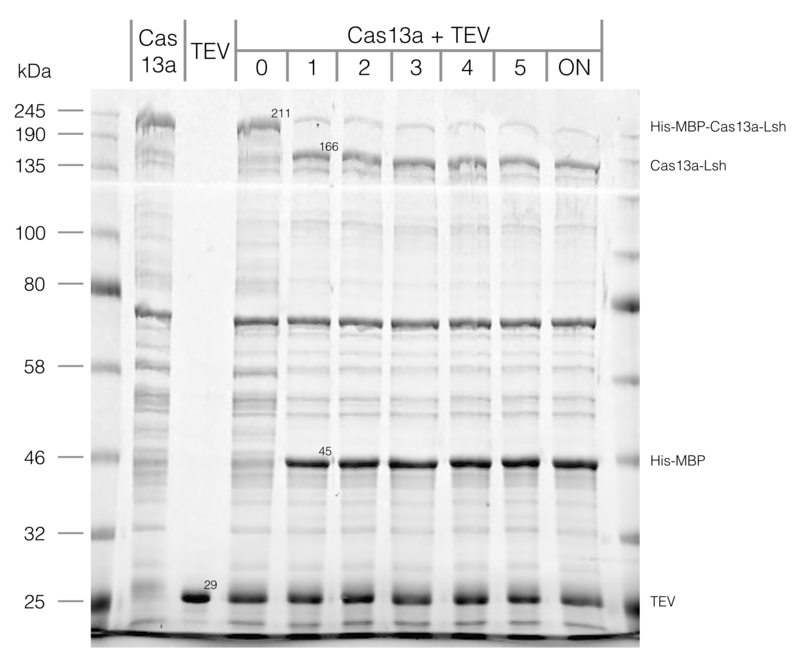 In our project, the TEV protease is a main component in the Intein-Extein readout, but also was used in the purification procedure of our Cas13a proteins. We improved the BioBrick BBa_K1319008 by adding a His6-tag, which made it possible to purify this protease. We show here the characterization of our improved BioBrick, but the completed details are available in the Registry page: BBa_K2323002. 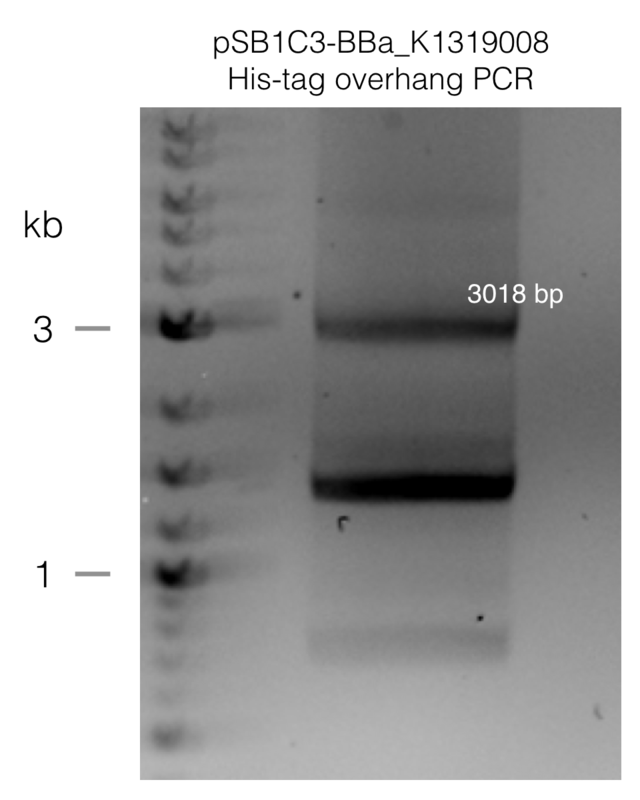 The His6-tag was added to pSB1C3-BBa-K1319008 by PCR with overhang primers p-TEV-His-fwd and p-TEV-His-rev. After PCR we ligated the plasmid using the T4 ligase. This sample was then transformed in E. coli DH5α for plasmid storage and E. coli BL21star for protein expression. We expressed the TEV protease in 2xYT medium and purified it via affinity and size exclusion chromatography. 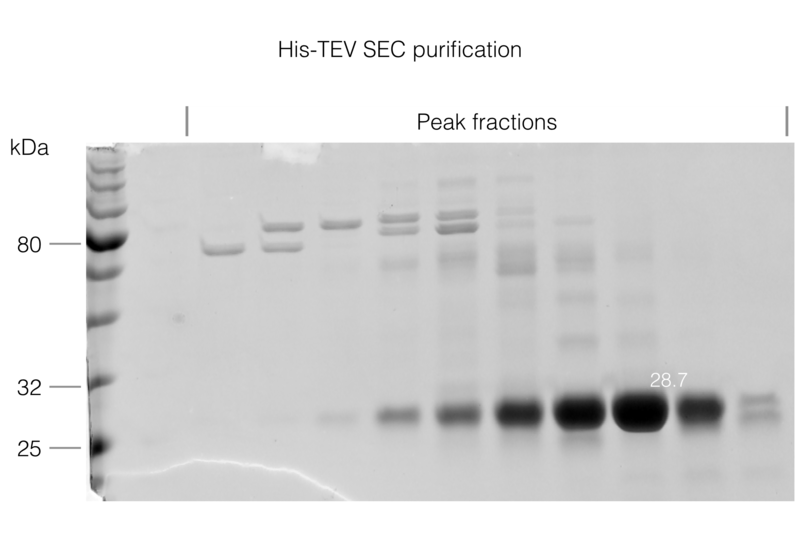 The gel images show the purity of the TEV protease. We stored the sample in TEV storage buffer at -80 °C. For an activity test, we incubated 30 µg His-MBP-Cas13a-Lsh as substrate with 1 µg of our TEV protease. We inactivated the cleavage reaction by adding 1x SDS-loading buffer. We analyzed the reaction with a SDS-PAGE and loaded samples, which were incubated 0, 1, 2, 3, 4 ,5 and overnight. The gel shows that nearly all our substrate is already cleaved after 1 h into His-MBP and Cas13a-Lsh. Next, the activity should be analyzed between 0 and 1 h to correctly evaluate the results. However, we highly purified our His-TEV protease and also used it successfully to process our Cas13a proteins. Here, we provide a BioBrick, which could be useful for all future iGEM teams.